Wolfratshausen, Germany, February 28, 2012 - Eizo Technologies GmbH (EIZO) announced the release of the Raptor SQ2802, a 2K x 2K monitor for air traffic control. The Raptor SQ2802 incorporates EIZO eBlue LED backlight technology which provides low energy consumption, long lifetime, and outstanding image quality. With EIZO eBlue LED, the Raptor SQ2802 achieves a maximum brightness of 350 cd/m2 while consuming just 120 watts. At a typical brightness of 70 cd/m2 used in many ATC control centers it requires only 60 watts. These extremely low power requirements significantly decrease heat production and reduce electricity costs. Additionally, the eBlue LED backlight has a lifetime of more than 100,000 hours. The EIZO eBlue LED also provides superior brightness uniformity across the screen and less color shift. This ensures more consistent brightness distribution and color reproduction which is typically difficult to achieve with large-screen monitors. An integrated automatic backlight stabilizer allows the controller to set the backlight brightness and ensure it remains constant through the life of the backlight trays. The eBlue LED backlight trays are backwards compatible with the CCFL (cold cathode fluorescent lamps) backlight trays used in EIZO's previous 2K x 2K monitor, the Raptor SQ2801. The Raptor SQ2802 is equipped with dual DVI-I (dual link) connectors. Single or dual BNC x 5 connectors are optional should the monitor be required as a drop-in replacement for the Sony DDM CRT. The monitor comes in four versions to meet various installation requirements - desktop, chassis mount, panel mount and VESA mount. The Raptor SQ2802 is available without a fan as an option. In addition, a second power supply is available for customers who require a back-up. The Raptor SQ2802 support resolutions from 640 x 480 up to its native 2048 x 2048. Any non-native resolution can be displayed in its actual size, scaled proportionately, or expanded to fill the screen. This is helpful when receiving other non-native resolutions as is typically necessary for system bootup. It also means an auxiliary monitor is not necessary to view boot data or failure data. 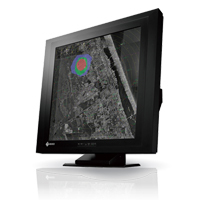 EIZO will exhibit the Raptor SQ2802 at ATC Global in Amsterdam. EIZO will be located in hall 11 stand H614.